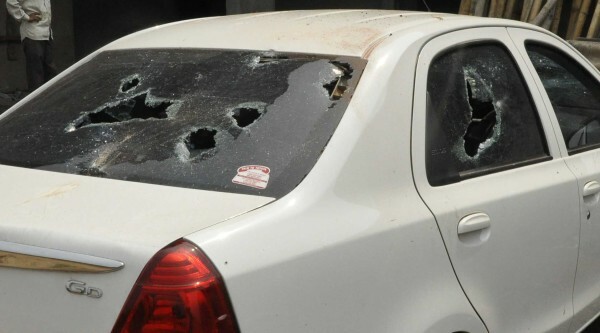 Couple of streets in Angol area were tensed on Monday night after there was a clash between two groups which followed with stone pelting and several vehicles were damaged. Vinayak Nagesh Patil (17) and Akash Manohar Sayanak (21), both residents of Shivshakti Nagar, Angol were injured in the clash. The incident allegedly occurred when Vinayak had gone to buy something from a store and while returning back a person spitted on Vinayak. Verbal clashes ended up in beating each other. The incident proved to be a spark in creating rumors, giving a communal dispute face to it. 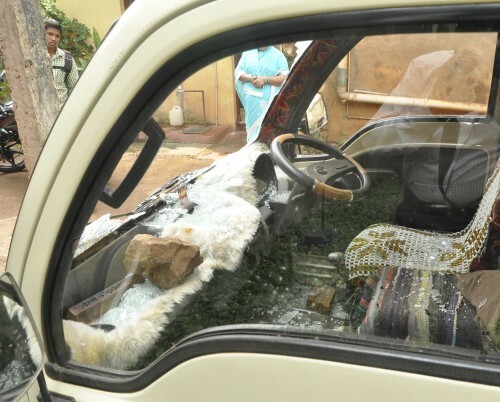 2 Auto rickshaws belonging to Aziz Oangeri and Riyaz Kotwal, one tata ace of Sarfaraz Kumane, car of Mumshad Bagwan and two wheeler of Mohammadali Mohammadshafi Kotwal were damaged in the incident. 5 youths were taken into custody and 7 were taken into custody with regards to stone pelting. Personal rivalries should not be given a communal colour. Aren’t there clashes between same communities ? Lets build a peaceful Belgaum. Minorities want protection from government, but they tend to fall into this type of things, they have (feelings) insecurity in their minds which they have imported from our neighbouring country, deficiency in brotherhood is the problem. Mr Shailesh, with respect i would like to tell u that, its not a mistake of perticular community. We ar part of divers culture and u will find different personalities. If some Psychopath has done something wrong, why to blame entire community. Change the mind setup. Every single soul love peace, so stop communal comment and do some constructive work. Unfortunetly it was my friend was shocked to know about this new on this morning ! Hi guys. To be honest, this is how the communal tensions spread. Minor incidents like this will take a bigger shape, until and unless we stop blaming each other. People who created this problem will get away somehow and leave the spark behind, just it needs a small blow of wind and it spreads like fire within no moment. We need to think as a responsible citizen of this country and never bring cast or religion in-between. Social media is the most dangerous weapon. Use it wisely. Let us stop here and get on with our job.